Salmon for Dinner, Heart and Brain Healthy. Lucky for me, salmon is one of my favorite fish. I love it baked, grilled, sautéed, whatever. Since it is considered one the the top foods for brain health, I eat it often. It is also great for heart health. Since improved blood flow surely aids both, you can see why it would be a good choice. It’s interesting, though not surprising, that most of the top 10 foods are on the same list. 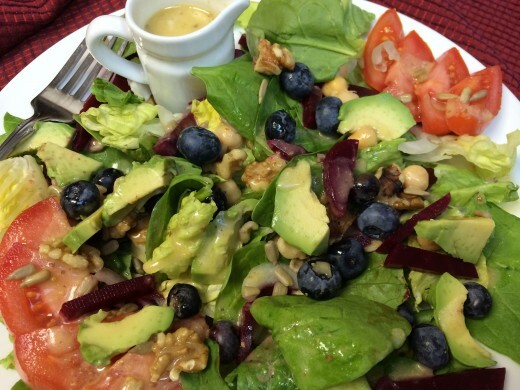 Nuts, berries, spinach (or leafy greens), olive oil, seeds, avocado, soy, beans and legumes, oats. Always near the top is oily fish–salmon or mackerel and tuna–that contain plenty of omega-3s. Salmon is supposed to be good for keeping your good cholesterol at a higher level. It’s a great excuse to eat it more often! That is what inspired this recipe. That, and a restaurant I used to visit in California. The restaurant served salmon with a delicious ponzu sauce. I was instantly hooked. It’s a favorite sauce now. When I moved away it was time to make it myself. The flavor in this sauce is excellent served with salmon, or with chicken or beef for that matter. You can see the complete recipe right here. 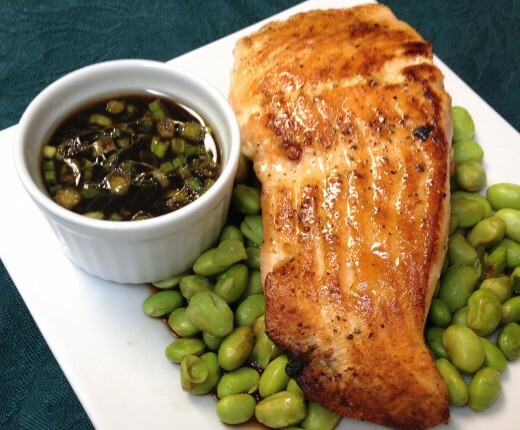 Teamed with edamame, salmon makes a super heart healthy recipe. Serve it with a salad like this one, and you have nearly all the suggested foods in one meal! What an easy, satisfying, and scrumptious way to increase your heart health! These are my two favorite ways to prepare salmon. The first, in my Calphalon Grill pan on the stovetop, the second on the Cuisinart griddler. Both work great. The grill pan gives the salmon that grilled, lined look. The pan itself is so easy to clean when you are finished. The Cuisinart Griddler gives the same lines and grilled taste. What’s great about it is the removable grill plates that go into the dishwasher, plus the reservable smooth side that is perfect for pancakes or french toast. Paninis cook up perfectly with the griddler too. Both have proven so worth the purchase!